Last week, markets experienced a 4-day winning streak before dropping on Friday, November 9. Despite those losses, domestic indexes posted gains for the week. The S&P 500 increased 2.13%, the Dow added 2.84%, and the NASDAQ was up 0.68%. International stocks in the MSCI EAFE had slight growth, ending the week up 0.20%. From interest rates to corporate profits, investors had a number of topics to consider. In this update, we want to focus on two key details that drove markets: oil prices and midterm election results. Oil prices continued to fall last week, posting the most consecutive daily declines in at least three decades. In fact, West Texas Intermediate (WTI) futures, a key oil benchmark, is officially in bear market territory. WTI has fallen more than 20% below its highest point over the past year. Some investors believe the price declines are another sign that the global economy is slowing down. Historically, people have used oil prices as one way to decipher economic health because they can correlate with global growth. When crude oil prices drop, greater economic challenges are often ahead. This recent decline may have a less concerning explanation. The United States sanctioned Iran last week while allowing eight nations to continue buying oil from the country for now. All of these waivers resulted in 1 million more barrels of Iranian oil being on the market than expected, the opposite of the anticipated tightening supply. Bottom line: The oil price decline may be more of a symptom of disrupted supply and demand, rather than an indication of the global economy's health. The long-awaited midterm elections occurred last week, and the results matched expectations for a split Congress. 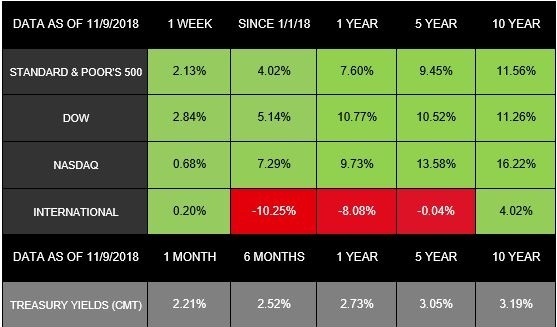 These results contributed to the midweek market rally we experienced. Post-midterm market results are generally strong. 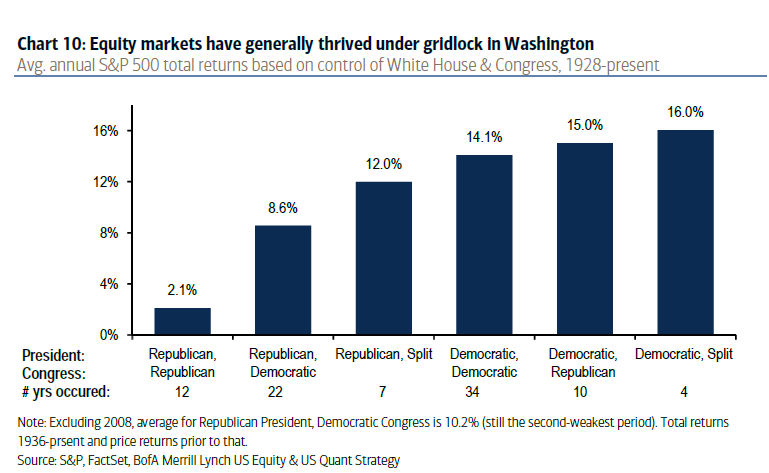 Over the past 18 midterm elections, stocks have always had positive returns from their lows in October to the year's end. Some investors even believe that October's struggles were a sign of the markets pricing in the election results about a month early. Taking a historical, long-term view, the current arrangement of a Republican president and a split Congress has resulted in 12% annual returns since 1936. The chart below shows how markets have performed through each potential party-control scenario. Although stocks have often done well when Washington experiences gridlock, the current scenario also makes a government shutdown or increased investigations into President Trump more likely. With either of these actions, market volatility could follow. Bottom line: The election results could help bolster market performance. The split Congress also brings potential for political uncertainty that increases volatility for investors. In many ways, this week's market behavior underscores the complex, interconnected relationships between geopolitics and the markets. If you have any questions or would like to dive deeper into how these situations affect your financial life, we're here to talk.